If you live in Kansas, storms are just a way of life. From spring tornadoes to winter blizzards, we see it all. 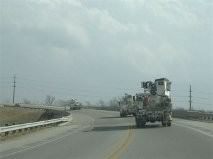 In the mid-west, seeing a convoy of bucket trucks headed to the latest hard hit area has become a common sight. Blackouts may leave your family hot in summer or cold in winter, your security system may not work, water pipes may freeze and burst, food in your freezer can thaw and spoil or without a functional sump pump your basement may flood. Head off headaches by installing a permanent standby generator. A standby generator is permanently mounted outside your home on a concrete pad and wired directly into your home or business electrical system to provide power to some or all of your structure's circuits during a disruption of normal utility power. In addition to a generator, you will also need to install a transfer ​​​​​​switch, a safety mechanism which is required by law. 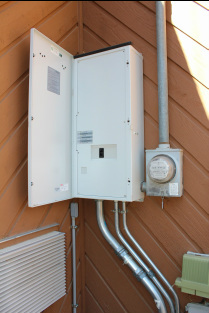 The homeowner may opt to install either a manual or an automatic transfer switch. With an automatic switch, the generator will start automatically, even when the homeowner is away. Compared to gasoline-powered portable generators, stationary units run on propane or natural gas. During a disaster, most homeowners do not want the hassle of attempting to locate gasoline to keep their generator operational. Stationary units are also generally more powerful and allow homeowners to keep more of the household running, including major appliances such as air conditioning units or furnaces. Existing generator systems should be tested and checked annually. In addition to installing generator Systems, CWC Electric, LLC, performs generator service and maintenance in Topeka, Lawrence, Emporia, Manhattan and surrounding communities. If you would like more information on installing a standby generator (or having an existing generator system serviced, call 785-215-8775 today! Chuck Hogan, owner of CWC Electric, LLC, will be happy to answer any questions or stop by your home or business and provide an estimate on installing a generator system for your home or business. 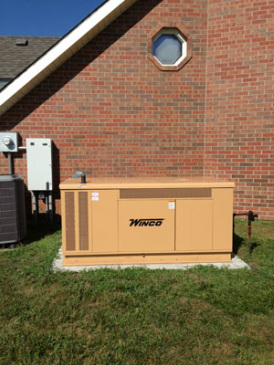 CWC Electric, LLC installed this 25K generator behind a garden wall and 80 feet from the home. The homeowner requested the distance because they did not want to see or hear the generator from their residence. A 1,000 gallon propane tank was installed to provide fuel for the generator in the event of an emergency. 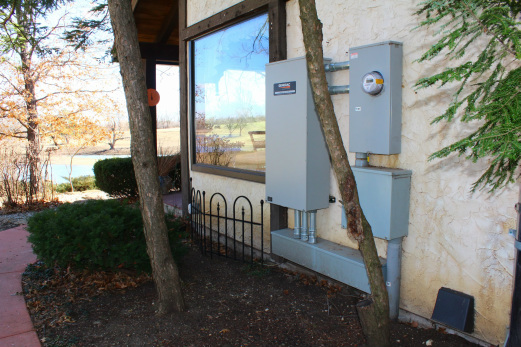 This 400 Amp Automatic Transfer Switch is the "brains" which will sense an interruption in the home's electrical power and automatically start the Generator. The homeowner does not need to worry should they lose power while sleeping or even if out of town for an extensive period of time. A backup standby generator provides peace of mind. Pictured above is the 8KW, the smallest standby generator offered by CWC Electric, LLC. Pictured above is a Winco PSS30 standby generator controlled by an ASCO 200-amp automatic transfer switch located on the back wall. Please call 785-215-8775 to schedule an personal appointment to receive an estimate on a generator system for your home or business.